Manages accounts receivables purchased, serviced or collected. manufacturers of powerboats including bowriders, cuddys, deckboats, and cruisers. Publishes informative, educational and adventure books. Some can be purchased from the company web site. Translation into English from Dutch, French and Papiamento. Based in Monterey, California. Translation, localisation and multilingual solutions, located in Monterey, California, United States. Interpreting and translation in Chinese and English. Freelancer based in Monterey, CA, United States. Financing receivables, servicing existing portfolios, or collecting on defaulted accounts. Experienced and proven local photographer, specializing in unique Monterey Bay weddings and events. Wedding and event videography in the Los Angeles area created with artistry and elegance. Find out about residential and commercial valuation services, based in Monterey County. Elegant wedding and special event videos in the San Francisco and Monterey Bay Areas. Serving Santa Cruz and Monterey Counties. Offers on line ordering. Carmel-based wedding videographer, serving Monterey and Pebble Beach. Professional TV cameraman. Design-build contractor in Monterey and San Benito County is your single source of responsibility for commercial building projects. Makers of Mexican foods under the El Monterey brand name. Provides company profile, history, and employment opportunities. Grower, packer, shipper, and national brand marketer of fresh fruits and vegetables. Monterey, California. Seaside. Serving members who live or work in northern Monterey County, California. Packer and exporter of fresh, frozen, and canned seafoods. Products include squid (calamari), sardines, anchovies, and mackerel. Specializing in wedding photography in the Monterey Peninsula. Serving the San Francisco and Monterey Bay areas. Background of the chef and contact information. Color and black & white wedding photography. Located in the Monterey Carmel area. bus tour to yosemite, monterey, big sur coast, hearst castle, wine country of sonoma and napa wine. Real estate appraiser serving the California counties of Santa Cruz, Santa Clara, San Benito, and Northern Monterey. providing full air service for the california central coast area. offers charter and commercial flights, visitor information, parking and security tips. serving san francisco, the monterey peninsula and the silicon valley for tours, charters, airport transfers, and commuter contract and special event shuttles. Broker of certified organic and conventional ingredients, including fruits, juice and puree concentrates, vegetables, oils, and sweeteners. Serving the San Francisco Bay Area, Santa Cruz and Monterey Peninsula. Offering wedding and event photography, portraiture and digital imaging. National marketer of fresh mushrooms, supplying products for sale to supermarkets and foodservice operations. Product and nutritional information, job opportunities, and recipes. Comprehensive ocean stock footage library including sharks, whales, dolphins, topside and underwater marine life on film and high definition video. Based in Monterey, California. Offers in-home cooking, dinner parties, and private lessons. Sample menus, pricing information, and chef profile. Serving Monterey Peninsula. USA. Design and manufacture of woven broadloom carpets for residential and contract markets, from polyamide. Detailed product catalogs, with technical specifications. Part of the Tandus Group. Supplying professional sound reinforcement, data and video projection, staging, drapery, and lighting services. Locations in South San Francisco, Monterey and Anaheim. Custom lapel pins and emblematic jewelry. Also offers key tags and badge holders. Shirley Hadley specializes in wedding photography in the Monterey Bay Area and some examples of her work are displayed. Wedding and commercial photography and video serving the San Francisco Bay Area and Monterey Bay. A Monterey Bay area architect specializing in Green Architecture. Licensed contractors specializing in green building construction in San Luis Obispo, Southern Monterey and Northern Santa Barbara counties with experience in straw bale construction and use of insulated concrete forms. santa cruz, california, united states. light to medium duty towing and recovery services, specializing in local and long distance transport, campers, trailers and unwanted or abandoned vehicles. Shirley Hadley specializes in wedding photography in the Monterey Bay Area. San Francisco Bay Area photographer, shoots weddings, corporate events, portraits, models, and commercial work. San Francisco, Santa Cruz, San Jose, and Monterey Bay Area. flight schedules, weather, maps, directions, noise abatement and traffic pattern procedures, press releases and information for visitors and pilots on the airlines, ground transportation, parking, general aviation services and environmental reports. Licensed contractors specializing in sustainable building construction in San Luis Obispo, Southern Monterey and Northern Santa Barbara counties with experience in straw bale construction, insulated concrete forms, and alternative energy systems. National marketer of fresh mushrooms, supplying products for sale to supermarkets, foodservice and ingredient manufacture operations, and for preparation of processed, canned, and frozen mushroom products. Product and nutritional information, job opportunities, and recipes. Purchase Monterey County wine, wine accessories, gourmet foods and gifts online. Site includes wine shop, gift shop, wine club, tasting room and group info. Offers fresh cut California roses and grower direct flowers. Offers spice blends and dry rubs produced in Monterey County, California. Producer and online seller of Monterey and Paso Robles Chardonnay and Merlot. Online sales of scuba diving gear. Based in Monterey, California. A story based on an American cheese, including recipes and interactive games. Herbs, spices, teas, essential oils, potpourri supplies and recipes, gelatin capsules. Offers wine, accessories, gourmet foods and gifts. Also includes a club, tasting room, and related information. Shipping within the US. Full service dive shop in Monterey with guided dives. Home & garden chemical products. Shaving brushes, bee wax candles, scented hand and body lotions, handmade glycerin soaps, aromatic oils and other natural bath products. A variety of hand painted shades in a variety of sizes. Featuring Catalina, Native American, Western and Monterey designs. Favorite recipes offered by the Carmel, California High School Class of 1951 at their 50th reunion, enhanced with photographs of Carmel and the Monterey Peninsula. Sells Wisconsin cheese, gift baskets, Cheddar, Colby, Monterey Jack, co-Jack, Brick and Muenster. Offering gourmet coffee beans, coffee accessories and brewing equipment, and candied pecans. Dive charter boat in Monterey. Day trips in Monterey and Carmel area. Schedule on-line. BÃƒÆ’Ã‚Â©atrice Levinson is a practitioner located in Monterey, California. Iwama style in Monterey, CA. Member of AANC. This clinic is a multidisciplinary, regional center for the treatment of back and neck problems. Located in Monterey. An informative website with descriptions of dive shops, tour guides, charter boats, water conditions, and 12 easy access beach dives in the Monterey Bay California area. Monterey California Dive Charters on the 'Escapade' which visits all the premier sites of Monterey and Carmel. This site pulls together in one place the most useful pages for predicting Monterey sea conditions. Charter a Dive Boat in Monterey, Big Sur or Carmel. Located in Monterey. Offers pregnancy testing, peer counsel, ultrasound, labor coaches, maternity and baby supplies, and post-abortion recovery. Estate-grown Cabernet, Chardonnay and Merlot,with a Monterey appellation, plus Pinot Noir with Monterey County appellation from a neighbors vineyard. Lists wine notes, awards, and ordering information. A virtual reunion of former campers and counselors of the Jayson Camps - Camp Owaissa and Camp Monterey - in Monterey, MA, the heart of the Berkshires, 1926-1969. This site lists scheduled events at the Monterey Bay Holistic Center, as well as listing a plethora of alternative health links. Year-round whale watching trips in Monterey Bay, California. All trips led by marine biologists. A club for recumbent riders living on or near the Monterey Peninsula. In-home care for the Monterey, California area. Laguna Seca Races: Monterey schedule and information. Official site of Laguna Seca. Fitness and spa services, Pilates studio. Monterey. SCUBA diving program with dives in Monterey Bay. San Jose winemaker with vineyards in Monterey, Paso Robles, and elsewhere. Montereys Mopar Car Club, join us for runs, clinics and show. PADI dive training, equipment sales, and Monterey Bay guided tours. The center for local soaring adventure for the Monterey and San Francisco Bay areas. A dive store with locations in San Francisco and Monterey. Classes, trip schedules. Resides on the Monterey Peninsula. Contains hall of fame, cattery and feline information and images. Produces premium varietal wine grapes in Monterey and San Benito counties. Located less than an hour south of San Jose. Offers tandem, static-line, and AFF training. Produces premium varietal wine grapes in Monterey and San Benito counties in California. We present 'The Marine Animals of Monterey Bay' and offer a chat board for everyone who likes to enjoy the oceans. About Bruce Baird and learning vacations at Monterey and San Diego. Coed and women-only classes. A PADI 5-Star training facility in Monterey. Rentals, guided tours, and travel. A group of instructors that formed a dive club that offers a calender of trips to Monterey and a online forum. Guided SCUBA and boat tours, gear, and PADI instruction on breakwater in Monterey. With a tasting room located in Monterey, the winery produces all of its many award-winning wines from its own estate-grown grapes. 118 Laguna Seca Raceway Monterey, CA. Monterey, CA. Motorcycle Grand Prix and AMA Superbike racing. Event listings and news, tickets, and track data. 120 Laguna Seca Raceway Monterey, CA. Offers wild hog hunts. Includes trip details, a price guide, photos and taxidermy service. Located in Monterey. Annual race at Laguna Seca Raceway in California. Site offers information on past and upcoming events. Wine tasting, events, tours, and more from over 90 participating wineries. The Cypress Sea dive boat in Monterey. Schedules on-line. Private charters and corporate events on Monterey Bay. Located in north and west Monterey Counties, California. Contains news and meeting information, calendar of events, photos, member directory, and links. Includes sales list, photos, and profiles of horses. Offers horse training. Located in Monterey, Massachusetts, United States. Detailed descriptions of 33 California Scuba and Skin diving locations in Mendocino, Sonoma, and Monterey counties. Information on the school, its founders and instructors, class times, other schools, photos, ranking system, philosophy, weapons, lineage, and related details. Winemaker with vineyards in Monterey, Paso Robles, and the Napa Valley. Includes wine information, tasting room photos, news, and mailing list. With vineyards on the Monterey Coast and the Central Valley, this winery produces reds and whites. Includes an award list, vineyard information, and online sales. International racing, beginner through pro. Includes XC, downhill, dual slalom, mountain cross, short track, trials and jump contest. Monterey, California. provides equipment sales, service, rentals, airfills, SCUBA lessons, and underwater tours. Located on Cannery Row, one block from the Breakwater and San Carlos Beach. Dart and Jean Voice Dart offer vibrational healing and DNA genetic reprogramming workshops. Marina, California. NAUI Scuba Diving lessons in the San Francisco Bay Area plus information on dive sites from Mendocino to Monterey Bay. Laura and Seth Paris offer Traditional Chinese Medicine, acupuncture and Feldenkrais in Pacific Grove. Full service small animal and exotic pet clinic. Pet care tips, news, and information on their services. Avid birder Rick Fournier leads bird trips for individuals or groups in Central California. Includes some bird photos. A small underwater photo gallery, a good assortment of Monterey and SF Bay Area dive links, and assorted other diving links. With a 6-diver-max, Sanctuary makes relaxed, unhurried visits to all the pristine sites of Monterey, Carmel and the Big Sur coast. All rental gear is available on request. Wings Stocks technical diving instruction, charters, and diving servicesin Monterey Bay. Deep, mixed gas, and rebreather technologies are a specialty. SCUBA diving club based in Monterey. Diving related travel, instruction, photos and video. Located in Monterey Park. Provides pregnancy tests, resources, support and counseling to pregnant women, maternity and baby clothes, and referrals. Planting and harvest pictures of a small Syrah vineyard in the Lockwood Valley of Monterey County. Also contains a brief profile of the vineyard and owners. Supporting and celebrating pregnant women and their families in the Santa Cruz, Monterey area with labor support, childbirth classes and birth photography. Offers a range of accommodation from budget cabins to luxury waterfront villas. Find a map of the park, location, rates, booking information and contact details. Operate four sloops from 34 to 47 feet for private charters and corporate events on Monterey Bay from Santa Cruz. Vessel details, profile, testimonials, rates and contact information. Non-profit organization, provides a full range of home care, extended services and adult day care to residents of Monterey and San Benito Counties. Produces organically-grown Chardonnay, Pinot Noir, Zinfandel, and a Bordeaux-style blend. Includes product descriptions, online ordering, and an award list. Also has a tasting room in Monterey. Sailing instruction on Monterey Bay and the Pacific Ocean. Located in the Santa Cruz yacht harbor. NAUI Scuba diving lessons, refresher courses, and Monterey Bay dive tours, San Jose bay area. Rarities with photos, identification problems, site guides for 4 prime birding areas, and top county birders. 169 Cold Water Images Kawika Chetron. Kawika Chetron. Cold water subjects from Monterey, Carmel, Big Sur and the Channel Islands. Take the opportunity to rent a classic vehicle such as the open air Model A. Other classic reproductions are available upon request. Focused on Italian exotic & classic automobiles & motorcycles during the Monterey Historic Races Weekend in California. Offers registration, event details, images and links. Specializing in gaited trail horse breeds, including the Tennessee Walker, Missouri Fox Trotter, and Spotted Saddle Horse. Monterey Bay, California. Virtual tour of popular northern Californian birding destinations: Cordell Bank, Palo Alto Baylands Preserve, and Monterey. Santa Cruz based sailing school operating a fleet of fifteen sailing yachts from 27 to 46 feet bareboat or skippered in Monterey Bay. Vessel details, rates, testimonials and calendar. Monterey Bay-area team provides photos and summaries of fields played, reports and photos of past events, field manual, field construction photos, illustrated roster, awards list, and history. Americas premiere wine festival, with wine tasting, events, tours. Over 90 wineries represented. Tickets and wine art posters sold online. Youth Pony Baseball and girls softball located in the Monterey Peninsula, Seaside California. Provides web design, optimization, logos, maintenance, and hosting assistance. Based in Monterey, California, United States. Offers site design, database solutions, and e-commerce applications. Located in Monterey Peninsula, California, United States. Provides Windows hosting with ASP, PHP, MySQL, and MSSQL support. Features unlimited domains and unmeasured bandwidth. Located in Monterey Park, California, United States. Performs web site development, graphic and logo illustration, consultation, hosting, sound design, and web programming. Located in Monterey, California, United States. Offering hosting, web design, and Consulting. Located in Monterey Bay, California, United States. Providing web and graphic design, maintenance, e-commerce solutions, database integration and application development services. Located in Monterey, California, United States. Monterey Barcode Creator support all major barcode formats, including UPC, EAN, code 39 and even Postnet barcodes. Code 39 font is completely free. 201 Laguna Seca Raceway Monterey, CA. 202 Laguna Seca Raceway Monterey, CA. 212 Calvary Chapel Monterey Bay Monterey, California. 213 Monterey First Free Will Baptist Church Monterey, Tennessee. Monterey, Tennessee. Stories for the Soul, sermons, upcoming events, and youth activities. serves monterey county. offers services, rates, coverage area, and contacts. bankruptcy firm based in monterey. Recording engineer and live sound reinforcement in Monterey, CA, USA. offering a broad range of legal services from offices in monterey park. monterey firm offering assistance with a broad range of consumer law matters. open to the public. includes access to westlaw and other legal reference information. The past and present of the Native American tribe of the Monterey Bay, California area. monterey lawyer, offering services for civil and criminal matters, including personal injury. Family, senior and teen calendars, classes, ministries, location, and service times. serves the bay area, santa cruz, and monterey counties. includes fees and what to bring to the appointment. Lubbock. Family, senior and teen calendars, classes, ministries, location, and service times. Features photos, worship schedule, sermons, upcoming events, and youth activities. A traditional, 1928 Prayer Book church. Includes location, services, staff, history, and Messenger columns. Specializes in residential and commercial properties consultations. Includes personal biography and information on classes. Based in Monterey Park. rev. patt obrien and associates provide licenses and conduct weddings at the monterey stone chapel, as well as in outdoor settings. gives testimonials, faq and overview information. Information on the church, location, links. An independent Thelemic center of ritual communication in Monterey Bay, California. Information about the church, worship services schedule, location and links. monterey attorney focusing on estate planning, wills, trusts, probate, conservatorships and guardianships. home and hospital visits if needed. serves santa cruz, monterey, and santa clara counties. includes services, rates, and contacts. Including investigation, record look-ups, transcription, translation, and ancestral publication. Corporate Headquarters, 2600 Garden Road, Suite 224, Monterey, CA 93940.
santa cruz-based firm also serving the greater monterey bay area. includes list of services, owner profile, testimonials, and officiant information. 244 Council No. 10469 The St. The St. Stephens Parish Council, of Monterey Park, California, list their current officers and offer more information by contacting the webmaster. medium-sized california law firm specializing in insurance and self-insured risk defense, covering all aspects of civil and business litigation. offices in san francisco, burlingame, and monterey. serves santa cruz, monterey, and santa clara counties. offers services and contacts. Ashtanga vinyasa yoga in the tradition of K.Pattabhi Jois. Descriptions and origins of Ashtanga yoga. Schedule of classes and instructor profiles. based in santa cruz, ca on monterey bay, lighthall offers ash scattering, charters, lessons, bare boating and mixers. Comprehensive site detailing the history of the Chandris Line and their ships, Australis, Britains, Ellinis etc. Also a history of the Matson Lines featuring the liners Malolo, Monterey, Mariposa and Lurline. A schedule of contra dances and their locations in the Monterey Bay area. monterey, ca (june) three day event. tickets, schedule, lineup, merchandise. nonprofit that provides information, education, and support for monterey bay area metal artists. Review and information for the John Broadway Tucker CD. Classes and milonga information in Carmel. history of the event with pictures. photo of the writer on a trip to monterey. Scenic images of The Badlands, Mt. Rushmore, Big Sur, Monterey, and Yellowstone. Large collection. official site with schedule and information, pictures, history, directions and tickets. portfolio of the events, weddings, and home decor of monterey, california designer kim england. oil paintings of monterey and carmel bay, california, marine life and scuba diving undersea scenes. Providing a professional, educational and positive environment for young people to learn all aspects of theater. Monterey Park, California. FAQ, class and event calendar, instructor photos, and contact details. photographs of ravi shankar and alla rakha performing at the 1967 monterey pop festival. With Studio Locations Throughout the Monterey Peninsula of California, USA. Dedicated to Producing Dancers of the Finest Technique and Quality. Electric and acoustic guitars as well as amps and other accessories from Australia. A profile of the artist prepared for a retrospective exhibition held at the Monterey Museum of Art in 1998. [monterey bay, california] offers streaming internet music, artist links, charts, news, concert video clips, jazz travel guide, and online store. steel blues & purples, with brass & glass accents, make these tall ships & monterey hull fishing boats unique & beautiful works of art. california. a night club located in monterey. this multi-level club has three dance floors with entertainment provided by bay area djs. 80,000 images from 1855-1999. Views of Monterey, Cannery Row, the sardine fishing industry, John Steinbeck, Edward F. Ricketts, the California Missions, and the San Francisco earthquake aftermath. resource for san francisco and monterey bay area celtic music. includes information on the traditional celtic music of ireland, scotland, cape breton and brittany, with event calendar, local resources, cd reviews, suggested first purchases, and musician links. SiteBook Monterey City Portrait of Monterey in Tennessee. 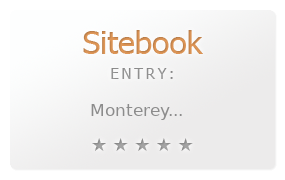 This Topic site Monterey got a rating of 4 SiteBook.org Points according to the views of this profile site.